The Gods had been very angry for several days now. The snow fall would just not relent!!! There had been no sun for days ! The group of pilgrims was stuck in the middle of a tarn on a high mountain pass. 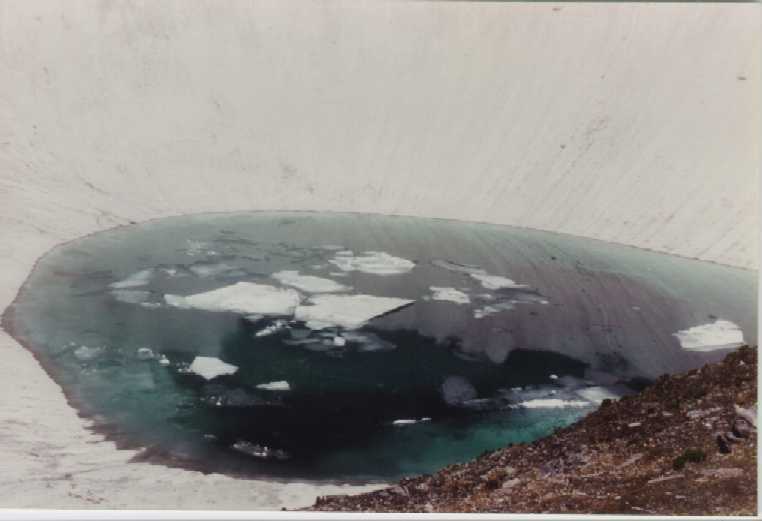 Having taken refuge in the frozen tarn, the depression of the bowel shape providing some shield against the blinding blizzard- blowing few meters above on the pass. Weeks earlier they had taken this short route to reach the temple of Badrinath- newly renovated and established by the Great Seer- Adi Shankaracharya. But they hadn’t bargained for anything like this. The bitter cold, the wind and lack of sun for days together had started taking a toll on the women and children of the group. They were a fighter clan of pilgrims from West-Central India, now utterly lost in the middle of this freezing cold desolate pass which they so desperately wanted to cross over to safety!! The relentless display of the fury of nature had now put the entire entourage of servants, women, children and horses in mortal danger. Just as they were praying for safety a loud rumbling thunder roared from the heights up above and suddenly the air was thick with dusting snow as the avalanche came crashing down with large boulders. The melee of rolling boulders and the asphyxiating mass of snow lasted only a few interminable seconds. In a minute the silence was complete. The group of pilgrims were literally on the path to eternal salvation buried under those thick feets of snow, lost to the world forever. I wasn’t aware of this story when I was almost dying to get under a shelter to save myself from the blow of the cold wind and drizzling droplets of freezing rain. The throbbing headache and the 104 fever burning from inside was not helping matters. Up ahead was snowy haze and behind was no different. I was walking on a snowy mountain ridge where the white spread ahead was occasionally punctuated by the brown and black shades of rocks and boulders. Atop a 5000 mtrs mountainous ridge I was, getting sicker every moment with a medical condition called AMS (Acute Mountain Sickness) even while the evening darkened, the frozen dew of the drizzle unrelenting. Fimally I spot the shelter and heave a sigh of relief. We had reached Baguwabasa- (4800 Mtrs),the highest I had done till then, but still a good 5 Kilometers away from Roopkund, the mystery lake. The lake which has intrigued many a minds, with those skeletons of horses and men, for at least last 70 years of recent public memory. It was the 1st of June of 1999 when Bunty (My Brother) and I arrived at the Bus stand near Kamla Market in front of Lal Quila. After some initial confusion we finally managed to board a bus that would take us till Nainital. We had prepared well for this trek. Trying the 5300 mtrs frozen lake mysteriously named and famed- Roopkund. It was early morning when one reached Naini Lake and we hired a taxi in a ziffy- it took us just about 5 minutes. Even as the last passenger was boarding down from the bus we were well on our way to Gwaldam via Bhowali, Almora and Kosi . After quick ablutions in the “Sulabh Sauchalaya” beyond Bhowali and breakfast the journey commenced. We had to reach the destination as quickly as possible and try to be at Lohajung by evening- the starting point of the trek. It was 1400 Hrs when we reached Gwaldam. The taxi driver was willing to take us to the nearest point tractable by a car for some additional payment. But we had to quickly find a Guide and proceed. The natural recourse was to visit the GMVN bungalow where we were promptly advised not to plan anything beyond Gwaldam as convenient transport links weren’t going to be available till Lohajung in the afternoon and in any case the guide will have to be found which will take time. 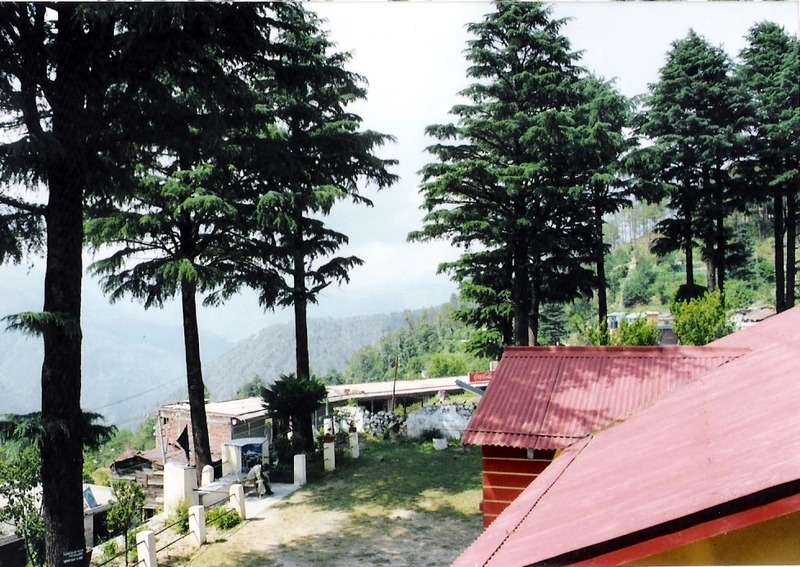 The taxi from Nainital sent off, we checked into a room in the spacious and beautifully located GMVN bungalow. The trek would begin the next day. Next hour was spent on finding out the young guide Harish Singh Bisht. Harish came strongly recommended from the GMVN staffers. So far unsure of the course ahead, things began to look up the moment we met Harish. He strongly recommended staying the night over at Gwaldam and prepare well on logistics. If we were lucky, we might just beat a potentially stormy weather. Harish was smelling trouble with the increasing changes in the skyline. Lohajung was easier reached in the morning with Jeeps over the newly constructed road. We could otherwise reach Lohajung with a 4 hour and 12 Km trek from Gwaldam, but would better advised to save the energy for the tough trek ahead, Harish opined. He wouldn’t only double up as the guide, but as the cook and triple up as the porter as well. 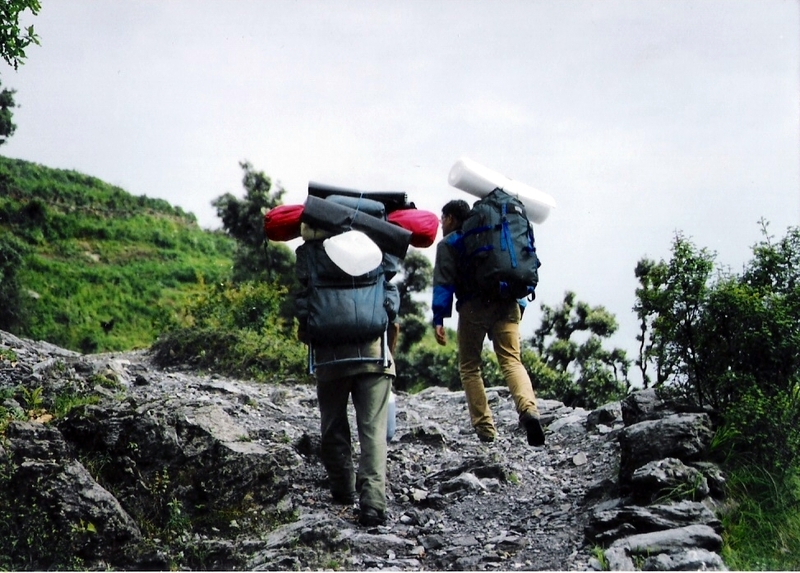 Harish sounded like the resident expert on Roopkund treks while he fluently enumerated the items of logistics and returned late in the evening with a load smartly tied onto his aluminum framed ruck-sack. This is where we had our first lesson on trek footwear. We had actually come armed for the Roopkund trek with pairs of Adidas sports shoes while aware that we shall be treading snow and mud. The problem was solved promptly by our guide come man-Friday for the next few days. He bought us a pair of hunter shoes. Though cheap and ill fitting, they had the necessary tread depth and ankle support. He decided to stay over at the guest house for some team bonding probably. After spending the evening high on rum and water we retired hoping to start early next morning. The morning next, of 3rd June, was sunny as the Jeep we hitched into in the morning winded its way downwards to Tharali. There was another group heading our way led by an elderly man- possibly in his early fifties. I was surprised for a moment noticing the age factor. Little did I know how intense a passion the Himalayas can be for a man so inclined as I would myself realize years later. Changing Jeeps at Tharali we headed up the road crossing over the Pindar river. It must have been 11 when we reached the Lohajung guest house where it took us sometime to locate the Chowkidar and coax him into cooking a lunch for us. Brief rest after lunch and we were ready to start the trek at 1300 Hrs from Lohajung onto hour camping location for the night on the outskirts of a village called Didna, now looking like a small speck across the wide valley. 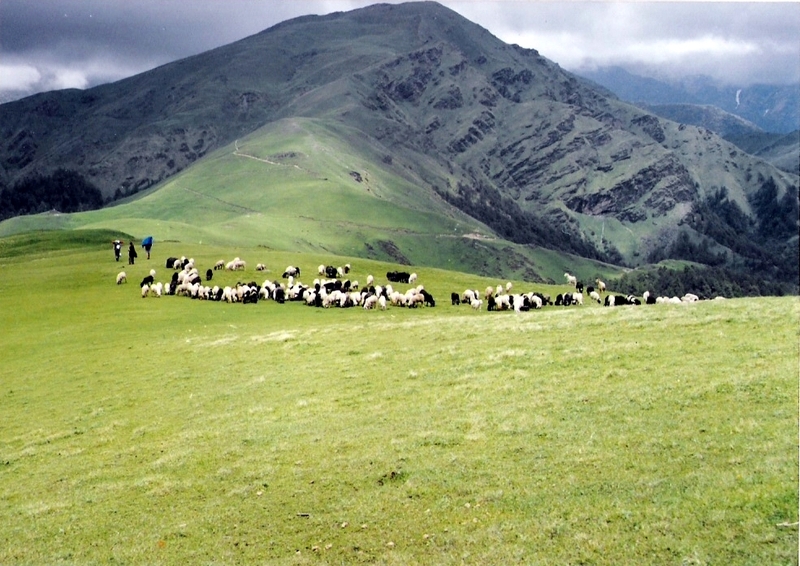 The usual route to Roopkund is Lohajung-Wan-Bedni Bugyal- Baguwabasa- Roopkund and back. But, the ever innovative Harish proposed a new way that could potentially save time and also show us some new Vista that the usual Roopkund trekker does not see- The Ali Bugyal. 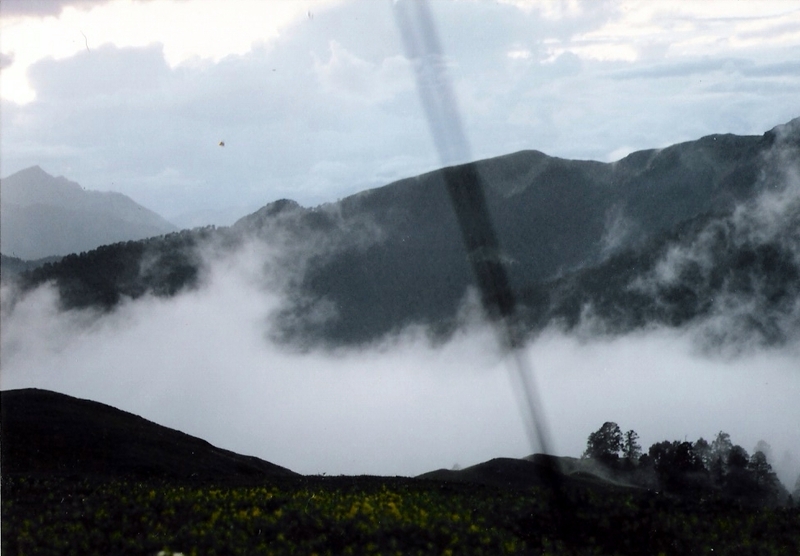 So we were to follow the route- Lohajung- Didna-Ali Bugyal-Bedni Bugyal- Baguwabasa- Roopkund and back. 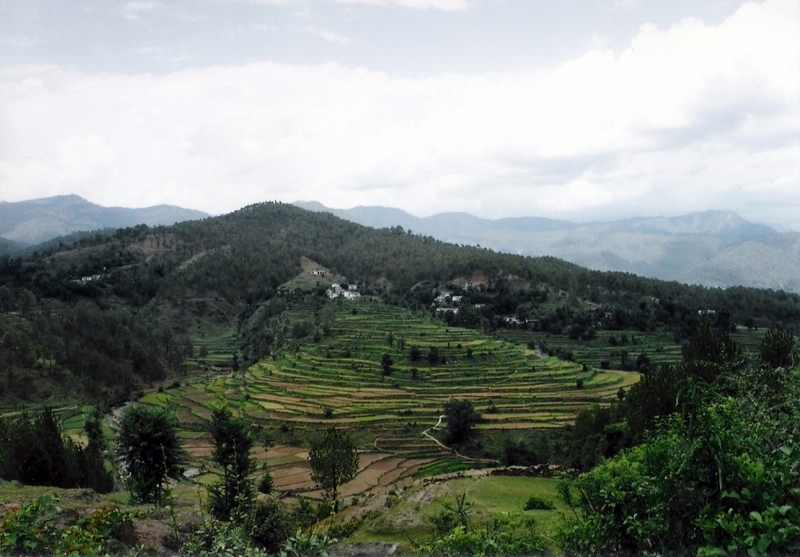 As Harish pointed out the Didna village to us he also informed of the distance as 8 Kms and the altitude 2200 mtrs. We were probably little disappointed calculating the net gain in altitude after 8 Kms of toil- considering Lohajung already at 1900 Mtrs. Essentially we were to go down 800 mtrs into the valley and climb back more than a 1000 mtrs to reach Didna village, all this in 8 Kms. I calculated the climb back to Didna to be a steeper climb than Ghanghria-Hemkund stretch I had done earlier, 7 years back in 1992. What else did we expect? I mused- we were trekking a 5000er destination here. Probably it was the anxiety accent which must have made us feel like that- but it was as if we were going down forever! The track to Didna leaves the normal route to Wan almost abruptly after the Lohajung village and winds steeply downwards. As one descends, the forest and the shade thicken every passing step down. Finally one comes to a clearing at the valley floor where horses are watered- conspicuous with the concrete drinking water tank and a water tap nearby- for humans. Well watered, washed off the trickling sweat and energy replenished with the chocolate bars, we set off for the climb ahead. Crossing over a Girder and Truss bridge that spans across a stormy and angry Nullah one sees the path ahead steeply winding up on the true right of the Nullah. This is where Harish introduced us to the word “Thokar”- otherwise meaning a “Hit”in Hindi….Harish-speak for a steep trek up. Trudging, panting and puffing, the mind strongly urging us on, we finally had to stop for a longish rest in the middle – about 400/500 mtrs up the valley. The rains had finally caught up with us. Few Didna kids, some villager coming back from Mundoli and the three of us resting under the tree, seeing the valley awash with fresh monsoon rain had a different serenity to it all. No sound human or artificial, the smell of wet earth, the dripping rainlets and the gentle baying of the goats and sheep!! It was a different world. Soon we were on the way up, the path now wet and flooded with rivulets and streams of storm water. Making sure we don’t try our luck further by wetting the new shoes, we made careful progress to destination. When we approached the village it was a place as if haunted. Not a soul in sight, we must have crossed the village totally unnoticed, the only indication of habitation being the occasional baying and mooing of livestock. 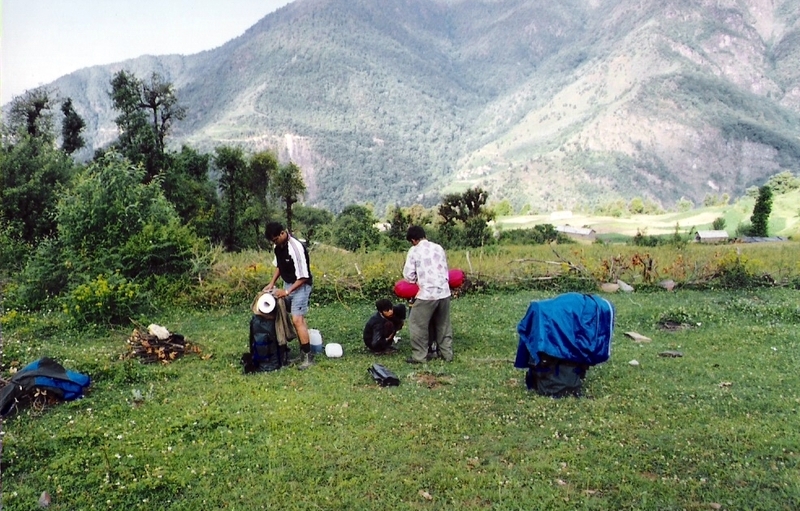 The camping spot is about half a kilometer from the end of the village on a trail that appears to be heading straight into the wall of a mountain behind. By the time we pitched the tent (an alpine 2 man tent- the capacity of which shall be a learning point soon) and had a cup of tea, it was darkness all around. Harish donned his cook avatar and hastily pulled off some nice tasting Maggie Noodles along with some Khichdi. Little postprandial talk- encouraging Harish to share some (real or imaginary) escapades with braving Firang lady trekkers and soon we drifted off to sleep. It was only the sunny morning next of 4th of June 1999, when we simultaneously became aware of the pretty surrounding we were in and the impossible looking task ahead. We were to almost repeat last evenings exercise up again. We were in fact to climb up the vertical steepness ahead all the way to the top and hit Ali Bugyal. The estimated climb up was 4 Kms and we were to gain close to 1000 mtrs again. With some quickly whipped up Maggi as breakfast we set off. The weather was pleasant and we made good progress before coming to the clearing in the middle of the vertical forest after about couple of Kilometers. Harish was usually ahead in spite of the heavy load, but whenever it was time to rest, one would find him perched high on some branch of tree smoking his bidi. A perplexed Bunty’s enquiry about the advisability on smoking while trekking would always invite a glittering and silent smile from Harish. Finally the ordeal came to an end after about 4 hours as the steep track became gradual and the accompanying tree cover thinned out. Smell of livestock, dung and hoove marks clearly indicated grazing areas ahead. The track led over a bump and we suddenly found ourselves on the top- In the middle of nowhere -in Paradise. 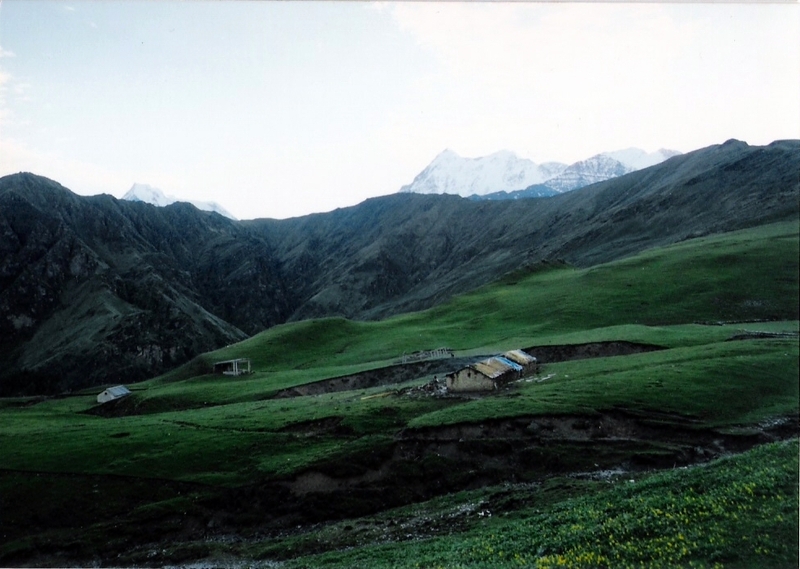 As one turned around a panaroma of green covered mountains and some distance up North the white clouds and snow indistinguishable, the green grassy meadow spreading ahead for miles…dotted with tiny colorful flowers announcing the advent of monsoons. That’s the first time ever that I saw a Bugyal- the gentle undulations, the feeling of endlessness, heights and distances shortened and illusionary, the paintings of millions of specks of colors on that huge green canvas, the gently blowing breeze and the partly clouded sun- it shall remain indelible, that first encounter with Bugyal- Ali Bugyal- 3200 mtrs. After resting a while and shooting to our heart’s content, we had to start soon for Bedni Bugyal which was still 5 Kilometers away at 3300 mtrs. After the steep trek in the first session, the relatively gradual path was easy to negotiate- the only problem being keeping Harish in sight because any path was a path here in that huge expanse of the Bugyal. This is where we met a shepherd tending to his herd of sheep, all lazily grazing and some baby-sheep cavorting around. After negotiating another small “Thokar” we finally came around the path that skirts the little mount on the Northern edge of the bugyal and finally unto another equally pretty vista that opened up- the more acclaimed twin sister of Ali, the Bedni Bugyal. 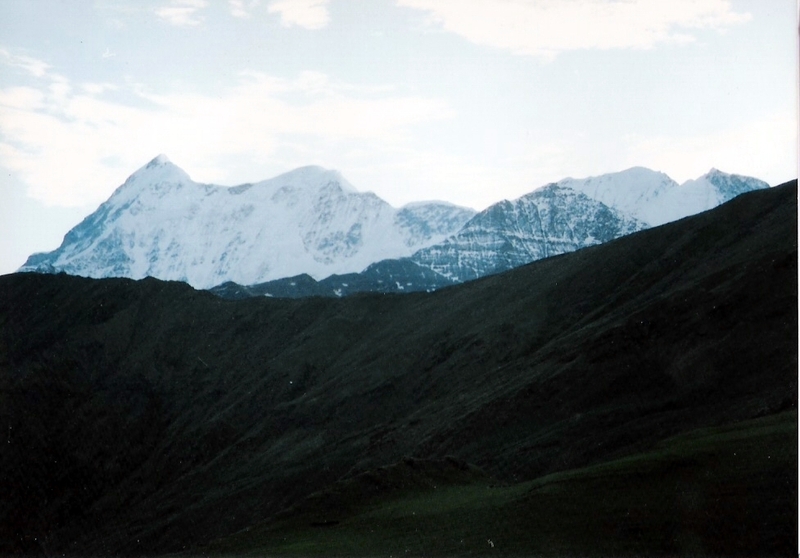 As we stood atop the high point from where the track descends down …the huge saucer of the green slope looked like that hidden jewel stashed away in that nook of the mighty mountains. Dotted variously with a little temple, a small pond of a water body, few forest huts and those zillion flower buds. 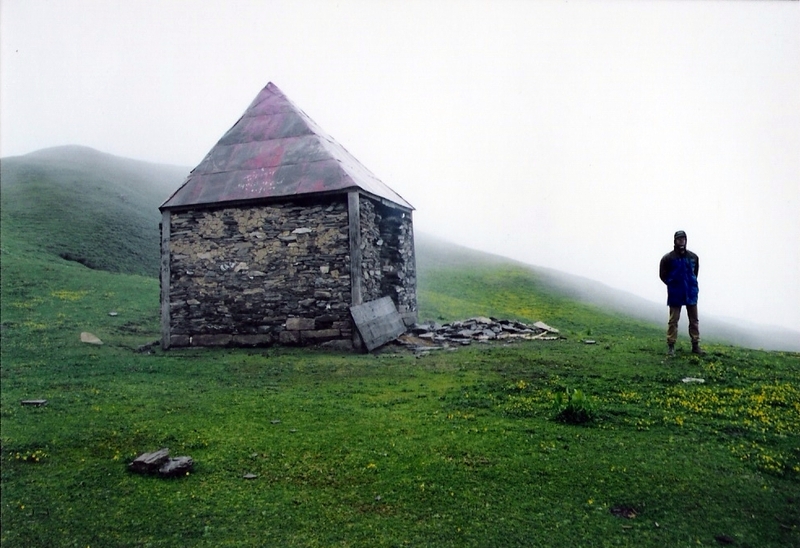 Legend has it that, this is the place the Queen of the king of Kanauj had labor pains (“Bedna”- Sanskrit- for Pain) when the King was on the way up with his entourage to visit the famous Homkund to pay homage to Goddess Nanda- several Kilometers beyond Roopkund. This king had also taken with him the court dancers and had a little party on his way up which famously invited the wrath of Goddess Nandadevi upon which the royal team perished to death at Roopkund- the locally believed alternate theory for the mysterious skeletons at Roopkund. Going by this legend, a festival (named as – Nandadevi Rajyat) happens every 12 years when a 4 Horned ram is led in a procession till Homkund and then left there to wander in the wild. The Nandadevi Rajyat is a significant religious activity in these parts, equally revered by Garhwalis and Kumaonis. 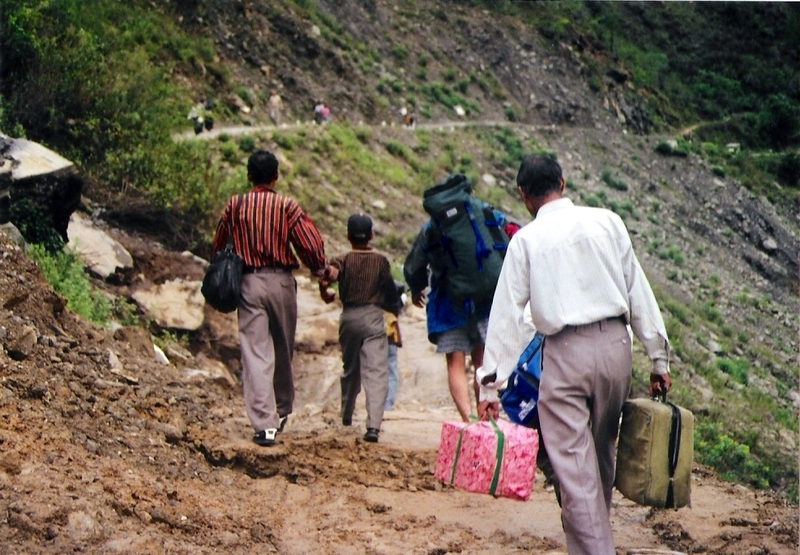 Last time it happened was in the year 2000, due an year after our trek that year in 1999 and the preparations were underway to repair the tracks and bridle paths. During the Rajyat, pujas are offered in the temple at Bedni Bugyal and finally at Homkund. The evening descended fast as we rushed to pitch the tent the skies looking ominous with gathering clouds. We had decided against taking shelter in the rest shed, considering the inches thick excrement of live stock who might have taken refuge in the place some days back. Just to be safe against wind storms we decided to pitch tent right next to the shed though. Harish – the chef prepared some “Atte” ki subzi that night along with Rice Khichdi. Retiring to the sleeping bags in the tent, we were certainly unaware of the hellish night that we were about to survive. That’s the stormiest night I would have ever weathered in the mountains. The filmsy Alpine tent probably would have with stood winds above 100 Kms per hour that night, the flapping sound of the Outer combined with the screaming fury of the storm almost rendered us sleepless. The three of us huddled inside the 3 men tent with the intermittent sounds of heavy rain falling on top of us and the storm threatening to blow away our filmsy little tent at any moment, we weathered the night. The morning was clear allowing us to take some quick shots of the proud line of peaks at the distance. One can see a whole array of those majestic pinnacles including Chaukhamba and Neelkanth. Harish pointed out Mount Trishul towards whose base we were headed and the black looking ridge of Baguwabasa where we were to spend the night. I was somehow feeling glum and dis-spirited. The cloud that soon enveloped the entire valley did not help matters. Skirting the Bedni Kund the trail rises up along a ridge and crosses over to the other side putting one in direct line of sight with the Black ridge. I had now a dull headache which seemed to be getting worse every moment. Up ahead was a stone overhang under which they waited for me- I was trailing behind. This stone overhang is the place called “Patar- Nachauni” – apparently the place where the king of Kanauj had drunken revelry with the courtesans. We had some candy bars there to revive energy and went ahead gaining altitude every moment. Finally the Big Thokar came into view that led us atop the Black ridge. Harish pointed out at the Cairn sort of a thing at the top of the pass which apparently housed the idol of a Stone Ganesha- the place called Kaluwa Vinayak. Was there a linkage with that pilgrim theory here? Is that why the revered God of Maharashtra- Vinayaka (Ganesha) present here? 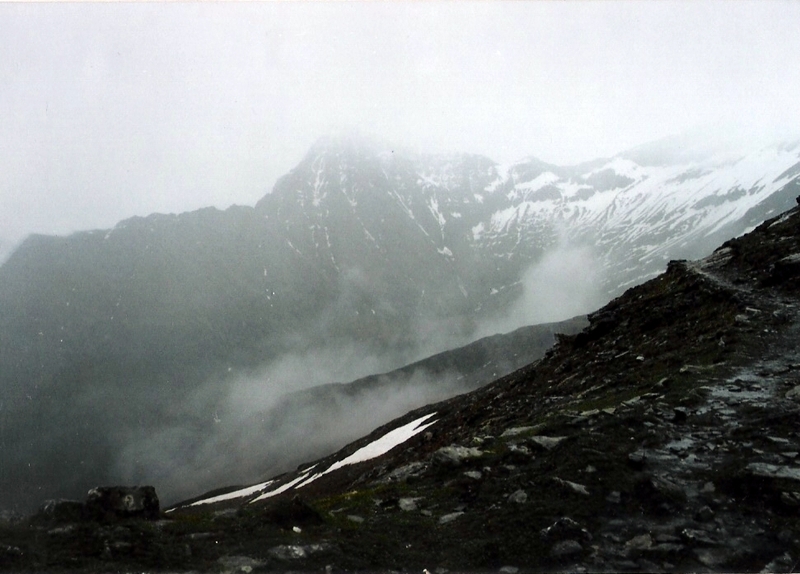 I started off on that steep climb to Kaluwa Vinayak …the track visibly interspersed with small melting glaciers. After 5 minutes, each limb of my body protested. It was as if my mind had switched off. I had to take off the 20 Kg Ruck sack and called at Bunty. Bunty, was all spirited, puffing up as usual, competing with the experienced trekker in his elder brother was surprised at my sudden illness. I cant forget the gusto with which he offered to carry my sack up the zigzag slope as I painfully carried myself to the top. He obviously had to make several trips along the slope to ferry my load. Up there at Kaluwa Vinayak it was cold and like all passes, strong winds chilling the fingers numb. We offered obeisance to the Elephant God and proceeded now along the high ridge covered with the foggy haze, the track now denser with snow and melting glaciers. Bunty was prancing around merrily like a gay bird, singing aloud with the view of snow while I was fighting a battle within, painfully painting that smile on the face but praying fervently inwards for some approaching shelter. 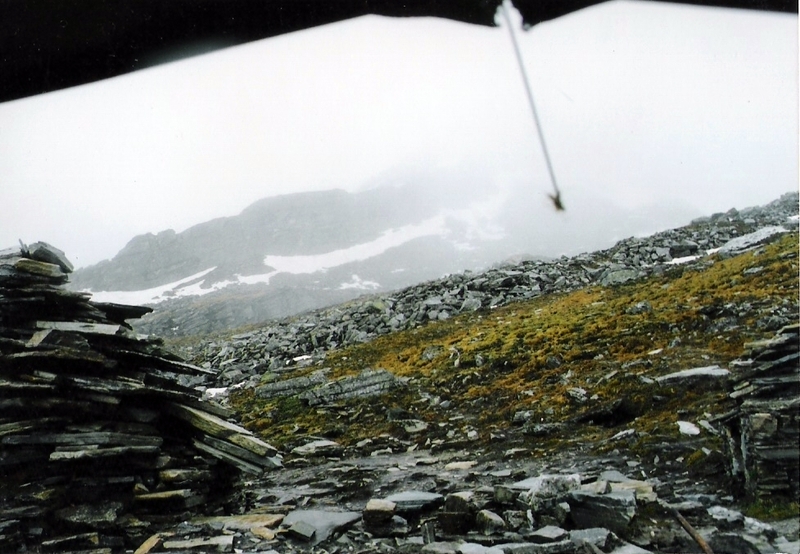 It must have gone on for good half an hour when the shed of a shelter loomed into view along the path suddenly. 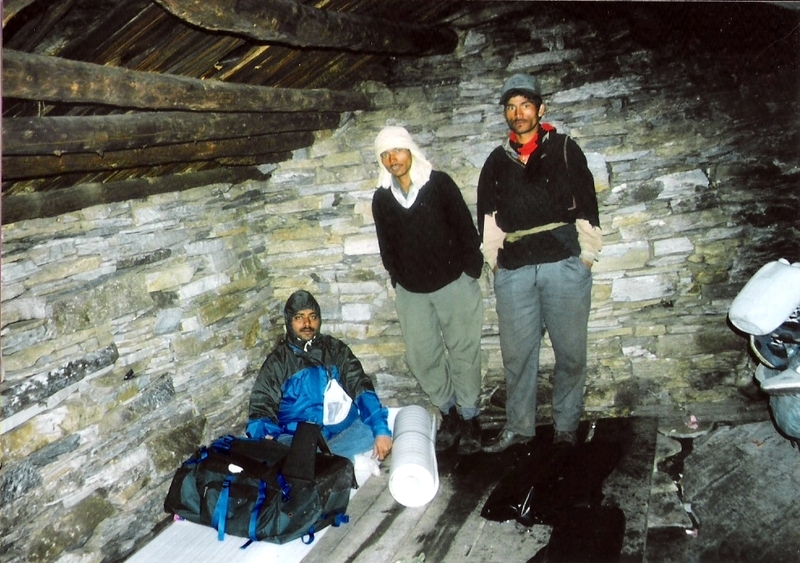 We had reached Baguwabasa- 4600 mtrs and I was sicker than ever. The quick ascent in 2 days had taken its toll and I was down with Acute Mountain Sickness. Any adventurous pursuit up the heights at that moment would have surely stricken me down with HAPE, but thankfully my body and mind both vehemently resisted such an idea. Resting in the shed as I took my temperature I noticed I was running high fever- 104 deg F. Bunty went out for evening ablutions and proudly declared how he changed the color-scape of the virgin snow-whiteness and his experiment at washing with handful of numbing frost on the backside. That evening I decided not to press on anymore and implored Bunty to go finish the objective. But Bunty, in ardent chivalry, decided to give me company and leave the battle for another day. Next day we were proceeding down after the momentary encounter with nature’s fury on that ridge that had perished the less fortunate pilgrims, centuries ago. Another group was also taking shelter in the same place. Harish arranged for some wood from somewhere and we had a nice fire burning. It was another night from hell. If anything, the next morning was worse. 6th of June 1999. 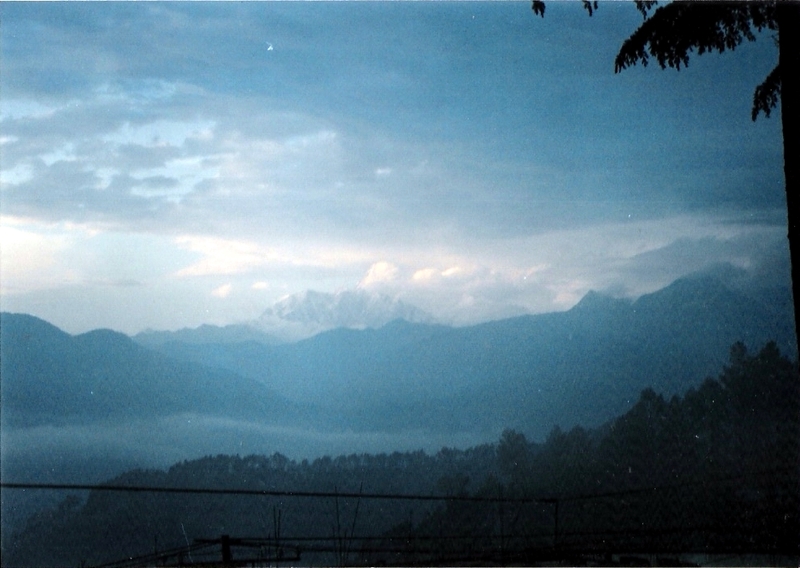 The haze hung denser, the landscape whiter- probably with fresh snows in the night. Its later only that I realized that this is what was called an acute condition of white-out. 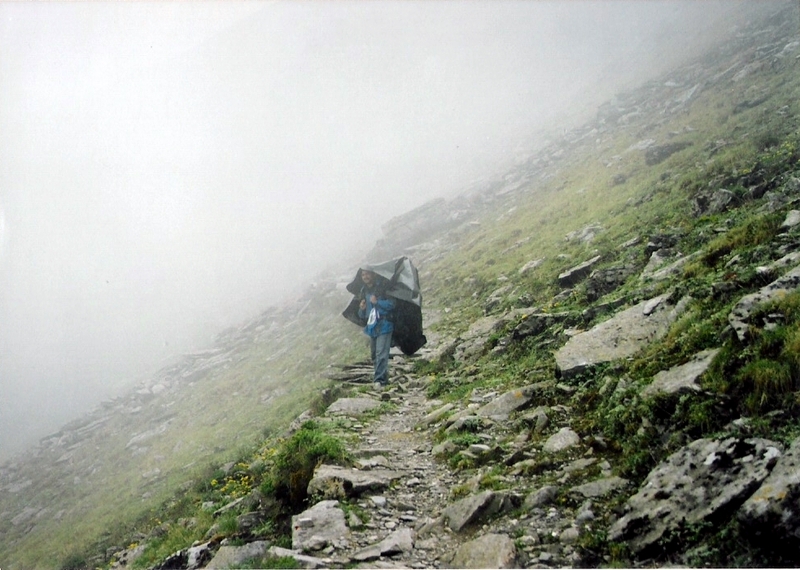 White outs in high passes with snow on the ground can be fatal by way of making trekkers loose their way and sometimes falling off into invisible abyss. We were thanking our stars even as we started back from the violently eerie environs. The mysterious pond was hardly 5 Kilometers away but severely intractable and possibly fatal in those weather conditions. The other group would Bivouac there for another day to attempt reaching the lake- we had no such luxury of time and health. The trek down was speedy to say the least. Surprisingly the fever went off in a ziffy and my spirit soared as I started loosing altitude. It’s only later that I realized that, this is the only cure of treating AMS or HAPE. Loosing altitude! The rain clouds had gathered momentum and so had the wind speeds. We put on the polythene covers and hooded up the jackets. We were in for stormy weather again. Bunty, who was always ahead on the way up was now strangely lagging behind. After an hour of silent walk, I and Harish reached “Patar Nachauni” water dripping all over, the rain gear thoroughly drenched. Bunty lumbered across the bend of the spur after 20 minutes, devoid of his polythene cover, unhooded and braving the rains as if he was enjoying it. As he drew near one could read cold fury on his face. Upon asking the reason, he let it all off on the poor “Polythene Cover”! Apparently as he turned one of the bends across the spurs a sudden gust of wind bellowed the Polythene cover into a parachute like contraption threatening to fly it off along with Bunty!! Poor Bunty had to scramble on all fours on the ground and let the polythene fly off to the valley below apparently thus saving his own skin. Since then he had been just weathering the rains in his elements for a good half an hour. With a hearty laughter, which I am sure Bunty wasn’t enjoying much, we treaded on to Bedni. The skies were still furious when we scrambled into the shepherd hut at Bedni. Another group of Calcuttans had just arrived from Wan, reporting even heavier rains below. 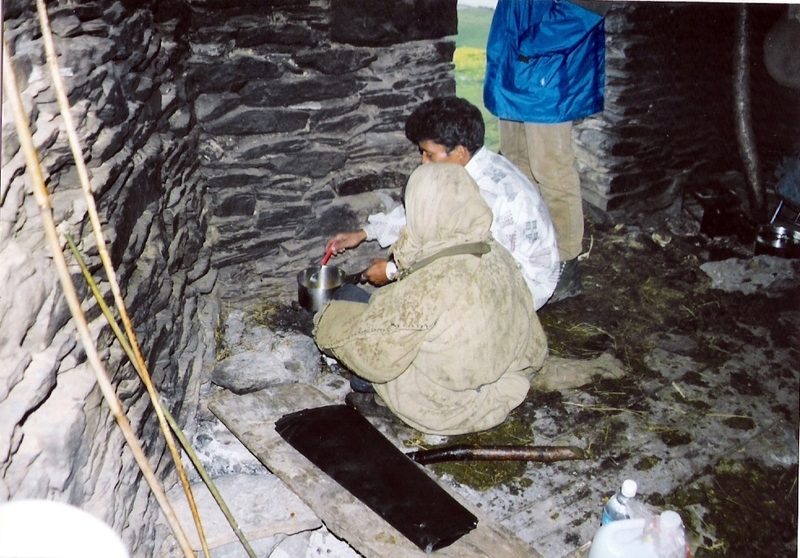 The evening was spent in lighting up a fire and drying up the socks, shoes, rain cover and all sundry items. The biggest problem was now drying- cause any wet cloths was only going to increase the weight and thus make the trek that much more difficult. After some partial success with the endeavour and a quick dinner of Noodles we retired for the night hoping that the next day would bring better tidings from weather gods. The next morning was dry but still not sunny. We had to make the best of the moods of the Rains since we planned to reach Lohajung that very evening. A total of 20 kms of trek down and up. The only thing that I remember of the trek back till mid point of Ali-Didna descent is the fact that, we were silent, we were frustrated with the incessant rains, we were thirsty in the middle of all that water and our feet were constantly slipping in the descents. The joyous-photo-shooting-self of the team was all but forgotten, the prime objective being to complete the day’s job. Bunty was having increasing difficulty on the way down, but he would compete with me forever. Finally when we reached the clearing in the mid point of the Ali-Didna stretch to have a breather, Bunty was nowhere in sight. 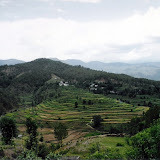 Finally Bunty arrived, eyes anxiously pinned to the ground, palms and bottom on the ground, legs stretched out in front sliding down with moderate speed from along the steep track that descended from the forests above. With streams of rainwater every where and the slippery mud, my tall brother was having a hard time even standing up! I burst out laughing as he landed himself in the clearing where we were standing and he stood up and exploded. - Was it a time to have fun at his cost? Was I aware how many times he came crashing on the steep mud-slopes? How many times he thought he was in mortal danger? And how on earth can I, the big brother be laughing at his pain? – I guess this happens in all treks, the moment the stakes go up, so does the anxiety and the mental stress renders sentiments so fragile that any insinuation can assume quarrelsome proportions. Harish intervened, citing how we were like epitomes of fraternal harmony like Ram and Laxman and we cooled down quickly. Soon we approached Didna under increasing intensity of Rains. Harish somehow managed to find a house with some signs of life and advised us to rest in the goat shed. Resting in that shed with goats, the smell of goat dung and goat feed strong on the nose, we were examining the feet which were now blistered badly and the shoes wet. 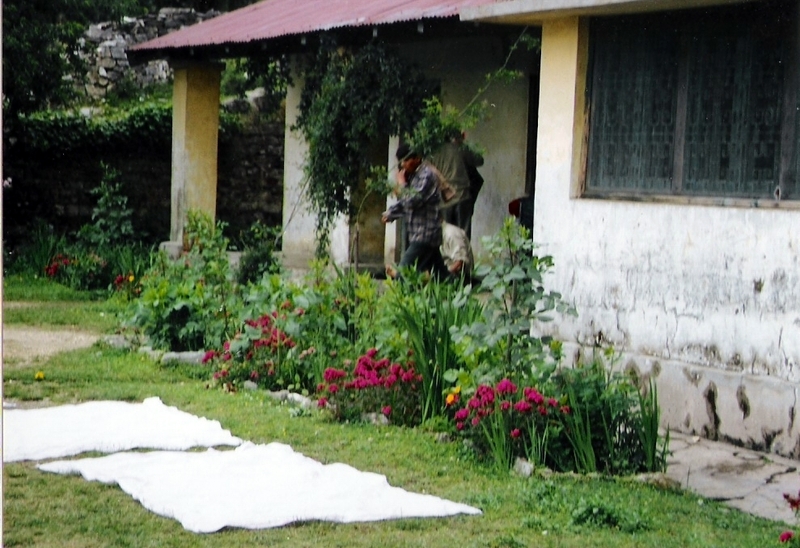 We used the time to dry our soaking beings while Harish –the Chef was at work for preparing the lunch. It must have been 1430 when we started off after lunch. The descent was uneventful, but we were dreading the ascent which we so easily came down through on our way up. I think, after the day’s experience we were thankfully numb to the ordeal awaiting at the last. Negotiating that steep way up we finally arrived at Lohajung around 1700 and proceeded forth to Mundoli – barely able to walk. It was darkness when we entered Mundoli and there was no question of us going further down. Harish arranged for the night’s stay in what he called as the hotel, where our bed was promptly shared by the cat in the house. We planned the route to Delhi for the day next Via Karnaprayag and Rishikesh and retired. That must have been the longest sleep for a long time- 12 hours! Next morning we hurriedly got ready to hitch a ride in the village Jeep. Harish accompanied till Tharali where we made his final payment exchanged address and bade good bye. We hitched onto another Jeep for Karnaprayag. Surprised awaited in the next corner when the Jeep wallah announced that the road is washed away ahead and traffic is blocked. 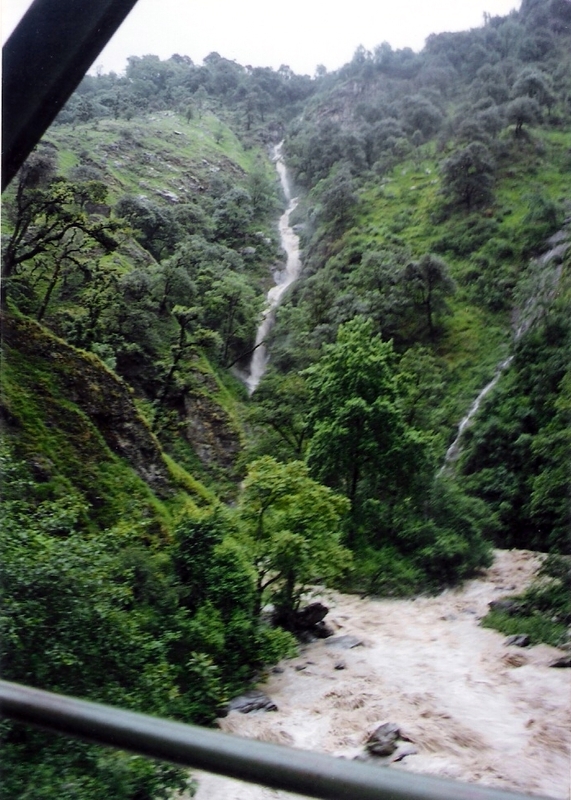 The road from Gwaldam to Karnaprayag is a state highway- one that follows the true left of the meandering Pindar Ganga. 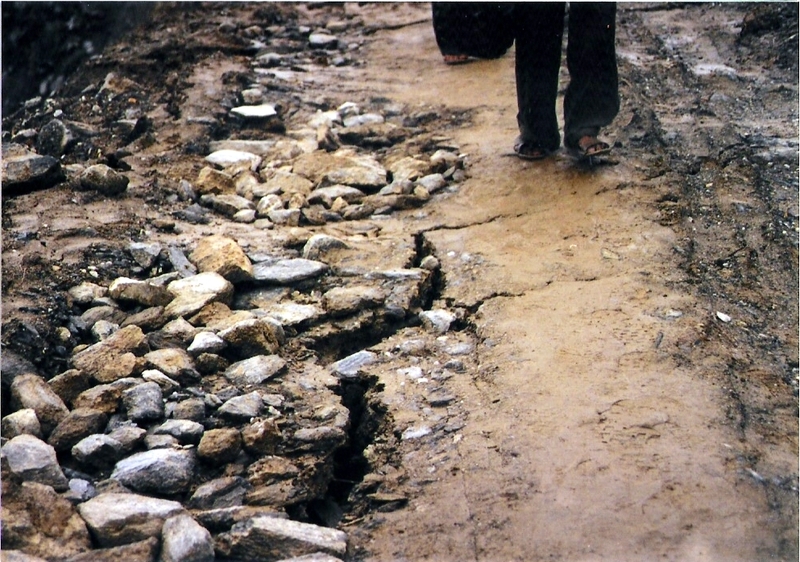 With all that rain Pindar Ganga was in its furious-muddy-foaming-form and in the anger had eaten away a 200 mtrs portion of the state highway. That’s when I realized that the road straight back from Gwaldam actually leads one up in the direction of the Pindari Glacier trail. The way ahead needed us to board down, walk across the cracked topography threatened every moment by the gushing torrents of Pindar Ganga and board another Jeep on the other side. Surely this was nothing compared to what we had been through. In due course we reached Karnaprayag and then onwards in a bus to Rishikesh. The rest one got sitting in the bus was a welcome change after all those hours of toil. Reaching Rishikesh in the evening we promptly boarded the next bus to Delhi and slept off till we were woken up at ISBT around wee hours of the morning. 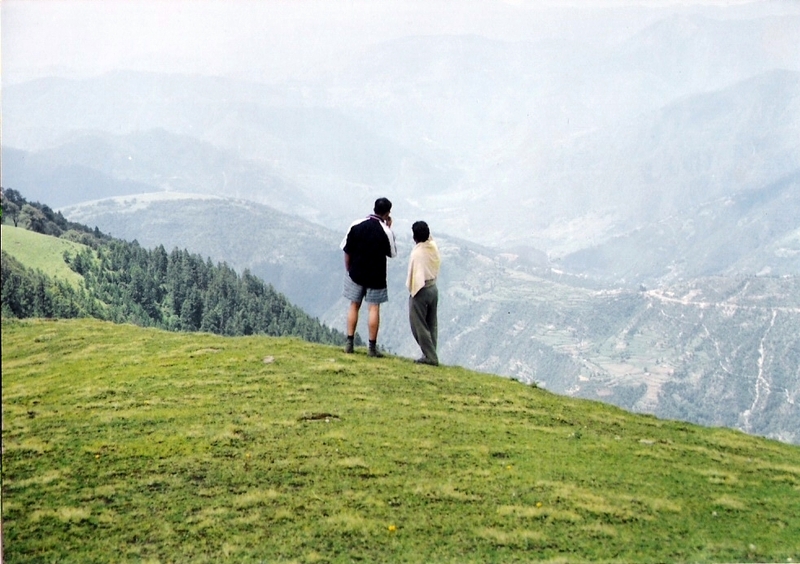 This was the trek that hooked Bunty to trekking for life and added significantly to the my singular passion. The Beauty of virgin Bugyals, The Serene peaks, The happy shepherd, the romantic tales of the Raja of Kanauj, the Gory deaths of the pilgrims, The Violent snow haze & white out, Harish Bisht and his Atte Ka Subzi, The fury of Himalayan Monsoons and my only brush with AMS that could have turned fatal !! How would one ever be able to forget till one lives? 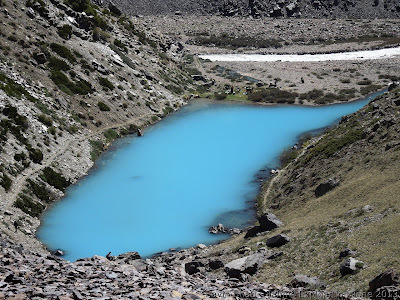 The Mystery of the mystery lake has since been solved, after the National Geographic team, in 2005, carried out scientific tests and establised conclusively the dates of the skeletons in Roopkund to be from the 8th Century AD - around the same time when Hinduism was being revived and reformed by Adi Shankara. These dates are around the time when the 4 epitoms of Hindu pilgrimage was being re-established by Adi Shankara and his disciples which must have started the idea of intra state pilgrimage on the four corners of India. The skeletons were found to have remains of women, children and men from two distinct ethnic groups. Probably one were the masters and the other servants. The men were found to be of large stature with one extra bone in the skull. One of the reasons for death were ascertained to be impact of stones. Thus the theory of pilgrims from central India, caught in the mountain path and perishing under rock and snow avalanche conditins gained currency. The Legend of the King of Kanauj seems to have grown on folk lore but could not be proved scientifically. The other theory of the Nepalese General Zorawar Singh's army caught up in snow storm in the mountains also holds little credence now. Interesting stuff HP. Stumbled onto your blog googling for something else, and find myself hooked reading your escapades. Minor nitpick, Zorawar Singh was the Dogra general of Gulab Singh (of Kashmir). He is one of the very few Indian generals to have made Tibet pay tribute to an Indian kingdom (rather than China).